Pol de Mont was educated in Mechelen, where he published his first poetry in 1875. He continued his studies in Leuven in 1877. Together with his friend Albrecht Rodenbach he founded "Het Pennoen". For his "Gedichten" ("Poems") he received an important Flemish prize in 1880. He worked as a teacher before he became the conservator of the Museum of Fine Arts in Antwerp in 1904. In 1905 he was one of the founders of "De Vlaamsche Gids". After he was accused of Flemish activism he was forced to resign from the museum in 1919. He became editor in chief of the newspaper "De Schelde", where Paul van Ostaijen and Alice Nahon were among his contributors. Apart from his impressionistic poems, Pol the Mont also produced work of a more ethnographical nature. Not everbody liked his work: Willem Kloos once declared that his work was 'like nature as one finds it on the lid of a chocolat box'. De Mont was a fine orator and spoke during the funerals of Hendrik Conscience (1883) and Jan van Beers (1888). He died in Berlin in 1931 when he was in that city to visit the museums. 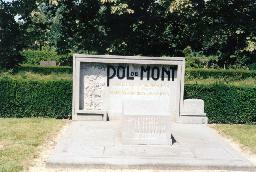 The grave of Pol de Mont at the Schoonselhof, Antwerpen.